Is a new breed of analyst finally arriving to disrupt the legacy model? Firms like HfS Research, Constellation and GigaOm have built their brands very quickly, in just a few years, and are now more visible than more established firms. As these results reveal from Analyst Equity and Kea's recent Analyst Value Survey of several hundred research consumers, Chapple states that "Firms like HfS Research, Constellation and GigaOm have built their brands very quickly, in just a few years, and are now more visible than more established firms. A great example of this is shown by the Net Influence Score from our survey, shown above." 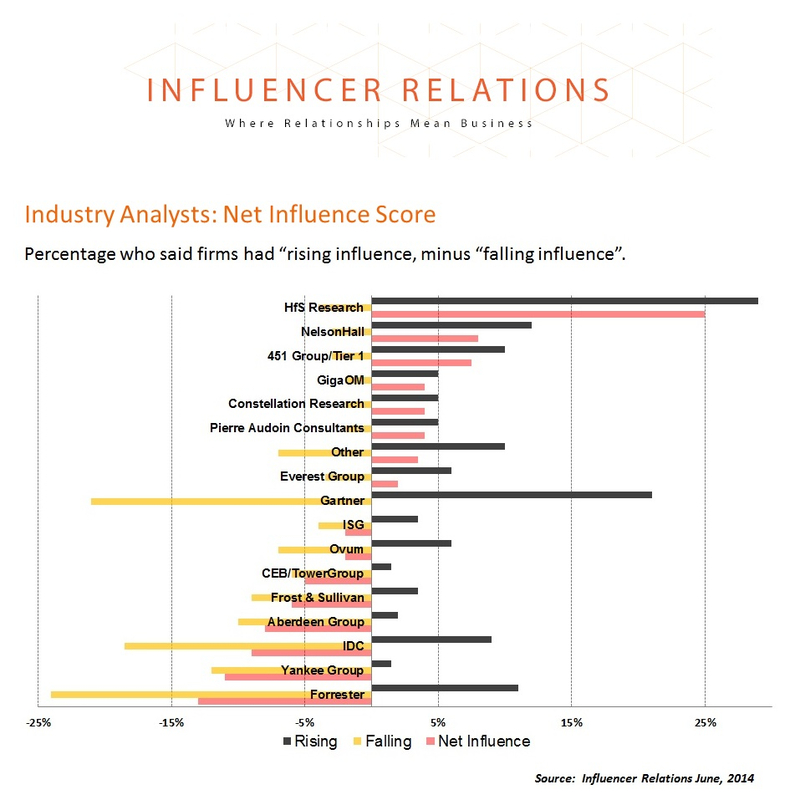 The Net Influence Score shows, for each firm, the net percentage of the respondents mentioning a firm as having rising or falling influence. This chart shows the percentages for the firms about which the most respondents had an opinion. Chapple continues, "Newer firms like HfS and GigaOm are coming from a lower base of awareness: that makes it all the more remarkable that HfS was not only one of the two firms which the most people commented on (alongside Gartner) but also had the highest Net Influence Score. GigaOm and Constellation’s scores were almost as high, but far fewer people commented on them. This also reflects HfS’s successful 50:50 income split between vendors and end-user clients, developed through compelling offers like its Sourcing Executive Council." Does this mean the analyst industry is going to change overnight? I believe it is unlikely that we'll see many new behaviors coming from the incumbents as a result of the gaining traction made by several of these upstarts. While Forrester seems to be making some more dramatic recent moves by replacing several traditional analysts with consultants to sell more strategic/consultative product to clients, the established "big two" of Gartner and IDC are persisting with the same firewalled model and approach that has served them so well for decades. And why change their successful models until they have to? Surely they are entitled to feel immune to disruption and innovation from nimble competitors... they are, after all, comprised of analysts who cover innovation and disruption for a living. However, what is changing is the emergence of boutiques, often with much deeper specialization, more open collaborative models and a more engaging, personable approach to working with clients. What is also happening is the capability of small firms to influence and make a damn big noise to industry - often bigger than the incumbents. Analyst firms which are steeped in social media and "born in the cloud" are simply more nimble, less costly to operate, and much easier to engage with in an open and collaborative model. They are also not steeped in legacy business practices and bloated bureaucracy that is highly resistant to change. Whether these boutiques will ever grow to be the size of Gartner is highly unlikely (those days are over), but it's clear that the legacy model is being slowly eroded - and - as so many people pointed out in my recent blog-rant, regulation shouldn't be necessary as many industries a way of evolving and disrupting themselves. Personally, I would like to see the analyst industry impose upon itself some form of self-regulation, but I do not believe we will have many willing accomplices who would join us on said mission. Net-net, just look at how social media and the open information market have disrupted other content-based industries such as PR, media, advertising, publishing and education... surely it's now only a matter of time until the analysts and consultants get turned on their heads with the nimble, engaging disruptors coming along to change the model forever... there's a whiff of change in the air and it maybe coming sooner than many of us realize. You can read more insight on this topic at Duncan Chapple's new blog post entitled "Mid-sized analyst upstarts are creating value faster". Wow - this really shows how smaller can be more impactful in today's market! You must be very proud. Duncan Chapple is highly respected as an analyst observer and this survey really shows how the industry is changing. Congratulations! Good to see 451 doing well - they've been producing some great quality research and becoming established as a genuine top tier player. 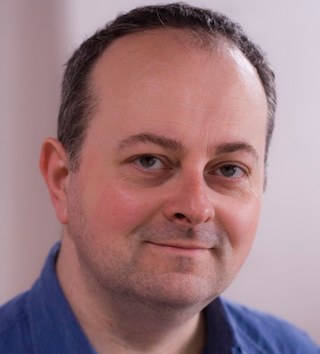 Great blog - keep it up Phil and team! Phil - many congratulations to you and your team - you must very proud. Question for you - the Gartner data seems very split - the same number sees them rising as falling. Why do you think this is? It looks like the big firms aren't too big to fail, that is good news for everyone. It's refreshing to see what Phil and his team writes and the researches they conduct. Wish there were more of these kinds in the industry. Change is the only constant :) congrats to you and your team. much needed disruption !